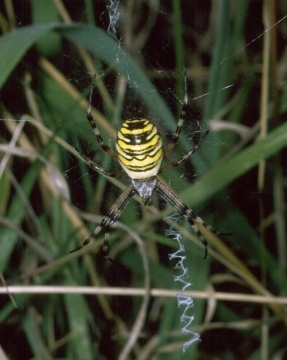 The Wasp Spider Argiope bruennichi was first recorded in Britain in 1922 at Rye and has long been known from the south coast of central England. However it has now spread and become much more frequent in suitable habitat in southern England. It is an easily recognisable spider. 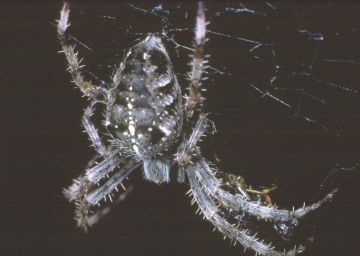 Key features to note are the horizontal black and yellow abdomen pattern and the zigzag 'stabilimentum' on the orb web. 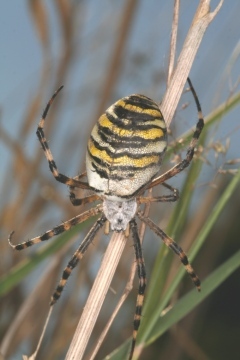 Argiope is about the same size as the garden spider Araneus diadematus (see below), but feeds mainly on grasshoppers so is unlikely to occur in most small gardens. It typically occurs in unmanaged rough grassland, often where damp or wet in winter. 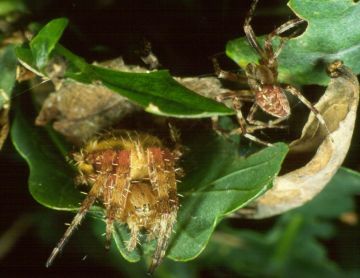 Cutting grassland, even during the autumn, winter or spring, will adversely affect the survival of the spider. Araneus diadematus comes in a variety of colour forms, but never the black and yellow pattern of Argiope.